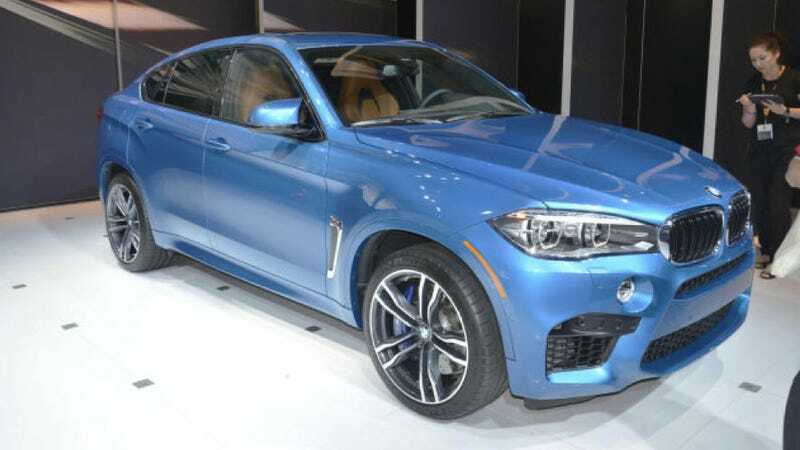 The new BMW X6 M is a tall SUV coupe thing with 567 horsepower. I think it looks awesome. I also love that we live in a world where this car can exist. The X6 is a car that has literally no point. It's a less convenient and less useful X5. You can't carry a ton of things in it, it's crap off road with a stock setup, and it's not dynamically as sharp as any of BMW's coupes. For all intents and purposes, it's the equivalent of a tall, less useful, uglier 650i xDrive Gran Coupe. And that's why I love the X6 M. The X6 was never a volume seller, it's a niche vehicle for a niche that BMW created. The X6 M segments that niche further, by providing the tall coupe buyer with entirely too much power. It's a car that exists simply because it can exist. Every single time I see an X6 M on the road, I get excited. And that's because you know that this person didn't buy the X6 M for any rational reason. Nobody needs an X6 M. If you buy an X6 M, I have to salute you for it. You purchased a $100,000 plus SUV-esque coupe with 567 horsepower that can no longer do any SUV things. The BMW M6 Gran Coupe costs about the same and is superior on the road in basically every single measure, other than height. The newest one looks great in photos, especially around back. Imposing and mean. And totally pointless. But isn't that the way it is with all of the greatest cars? There isn't really a reason for a Corvette or an FR-S to exist other than Chevrolet and Toyota want them to. It's the same with the X6 M. There couldn't have been demand for a car like this. Yet here it is. They'll sell some of them. And I love BMW for it.